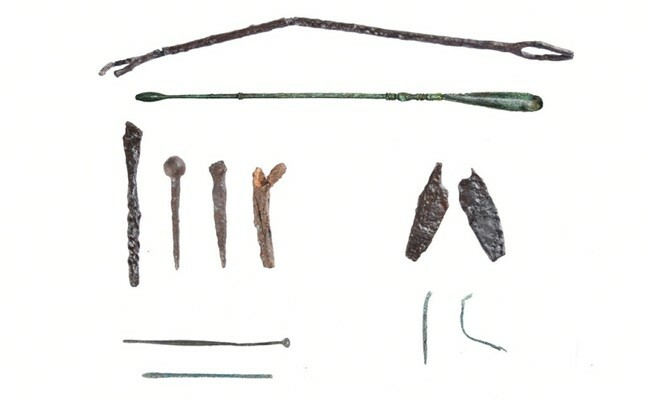 A team of archaeologists has found an ancient health center and medical tools in excavations in Turkey's touristic Gölyazı village in northwestern Bursa province, the Demirören News Agency (DHA) reported Thursday. The new findings show that the ancient city named "Apollonia ad Ryndacum," dating back to 2,600 years, had a working health and wellness center. The modern-day Gölyazı village sits atop the ruins of the ancient city, which is located on a small island in Lake Uluabat in the southern Marmara region. Developed in Roman era, the town gained more importance in the religious sense during the Byzantine period. Mustafa Bozbey, the mayor of Bursa's Nilüfer district municipality, said the new findings will shed light on the region and its rich history. Bozbey said that the region was an important center of medicine for the region, which is reflected in the fact that "Apollonia ad Ryndacum was a city in which the ancient Greek hero and demi-god of health Asclepius was respected." He said that the excavation team had previously unearthed a graveyard in 2016 that belonged to a physician and his family. "The graveyard and the physician's tools that were previously found reveal that Gölyazı was a center for medicine at the time. This shows that Gölyazı, apart from being an important touristic center which gives peace to people with its fresh air and water, was also an important place regarding health," Bozbey said. Preservation and excavation work, which was launched by the Bursa Metropolitan Municipality in the area heavily damaged by treasure hunters and natural destruction, mostly focused on the "holy area" in the region and was completed in December 2018. The area is planned to be opened to visitors in 2019 as an archaeological park.